When I was little, I’d spend entire recesses at school making little furniture for tiny, imaginary beings, only to leave them after 20 minutes and never see them again. Little did I know that grown-ups do this, too, except they call them Fairy Gardens. I’m so totally in. 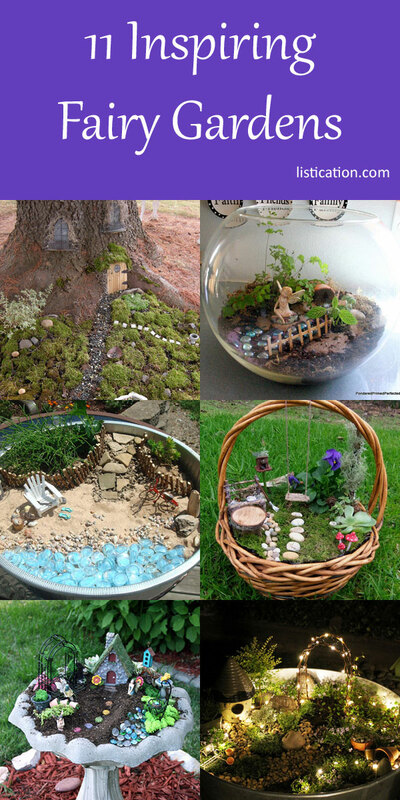 Here’s some fairy garden inspiration for you! Very interesting and amazing. You go girl. How do you protect rain n wind from disturbing the little fairy gardens. Can’t do much about wind, but we have ours in a somewhat sheltered area so it doesn’t get the brunt of bad weather. Still, sometimes it’ll require a bit of putting back together if weather is really rough. I have had very little trouble with weather issues, but I did use a tiny bit of sticky tack on the bottom of my gnomes to keep them upright! I use floral pins to hold lite weight items, but for the most part the rain is good for them (if they have drainage) and since they are low profile the wind doesn’t bother them. Thanks for including our little fairy garden! What about drainage on bird baths? place a thin layer of charcoal on bottom, some rocks over that, then your soil. This are great! It gets me worked up to try and make them myself! I love this one! Very much “The Shire” in Lord of the Rings”. So cute ! Love them all ! I just started one with my grandaughters who are 1 @4 and they love it ! I need to make one of my own . LOVE the Fairy Gardens, so going to do this! Love this. I’ve been looking at all the fairy gardens stuff lately. Def gonna try this. how much would you charge to sell that? Love this idea! Will make one for inside. My grandson is convinced that I have a leprechaun living with me! I would love to have a huge luscious flower garden, but not able to maintain with back issues. The fairy garden (probably one easy to reach as in bird bath) sounds perfect for me. I love ALL of the beautiful ideas and can’t wait to get started!!! I also have back problems, so last year I laid it out , sort of, and had a friend put it in the garden for me. overall, is plenty, according to Jogger’s Times. hi how much fayry garden lifes a beach? Thank you for including my basket fairy garden. Did you line the bottom? Have the same basket and I want to do this fairy garden. How to you keep the items in the Fairy Gardens in place? Do you glue them? I’m trying to figure out how to put one together and keep everything in place. Thank you. What did you use for the wonderful fairy lights?